Today, May 17, 2017 [Jestha 3, 2074], National Examination Board [NEB] has rescheduled the date for the Grade XI examinations. Due to Local Election Nepal 2017 [Conducted after 20 Years], the examination for Grade XI [Class 11] has been rescheduled. As per the new schedule, the Grade XI exams will be conducted from June 22, 2017 [8 Aashad, 2074] to July 2, 2017 [18 Aashad, 2074] . National Examination Board [NEB], examination controller office, Sanothimi, Bhaktapur has published exam routine on May 17, 2017 of Grade 11 [NEW ROUTINE- Rescheduled] for the academic year 2074 B.S.The Examination time will be from 7 AM to 10 AM. Grade 11 examination starts from 2074/03/8 and ends on 2074/03/18. 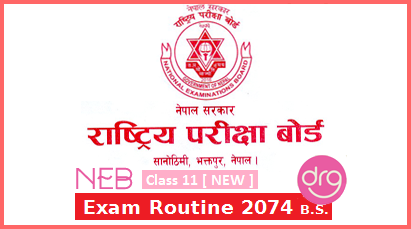 The Scanned NEB ORIGINAL ROUTINE of Grade XI [Class 11] 2074 Or you can visit & download PDF File from the official site "HERE". Below is the complete ROUTINE of GRADE 11 (New-Rescheduled) for the academic year 2074. 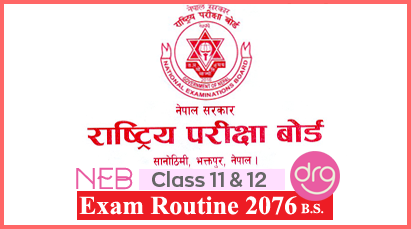 0 Response to "Routine Of Grade 11 | Exam 2074 | National Examination Board [NEB]"